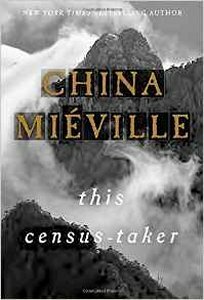 This Census-Taker, China Miéville (Del Rey 978-1-101-97632-4, $24.00, 224pp, hc) January 2016. Most of China Miéville’s fiction describes a spectrum between the almost formal preci­sion of novels like The City & The City and Embassytown and the more exuberant textual irruptions of Kraken or Railsea, and his style can range from a kind of ornate dialectical Mervyn Peake to the hardboiled irony of the post-Raymond Chandler school. His new no­vella, This Census-Taker, approaches neither extreme. Narrated in a subdued, almost muted tone by an apprentice census-taker recalling his troubled childhood in a thinly sketched-out world in which Something Bad Has Happened, it shifts suggestively between first- and third-person voices (and even into second-person for a bit), lending it an ominously unstable feeling as the narrator tries to grapple with what has happened to him and, by extension, to his world. His present ‘‘line manager,’’ in fact, advises him of his writing that ‘‘You can tell it any way you want… you can be I or she or we or they or you and you won’t be lying.’’ The trademark grotes­queries are kept to a minimum – lizards grown in bottles, a group of children who basically go fly-fishing for bats off a local bridge, an aban­doned movie theater, rumors of a time when people were ‘‘scared of all the engines and they smashed them all up’’ – and the plot is basically that of a murder mystery. The story begins with the unnamed boy at the age of nine, running frantically from his remote hilltop home into town, claiming at first that his mother has killed his father, then quickly recall­ing that it was in fact the father who was wield­ing the knife. But there is no body, bloodstains in the house have apparently been scrubbed clean, and a handwritten letter turns up in which the mother says she is leaving. But the boy has seen his father kill animals and throw them into a deep ‘‘dump-hole’’ in a nearby cave, and sus­pects that he’s killed and dumped a number of men there as well. The narrator comes under the protection of two scrappy kids named Samma and Drobe – part of that near-feral bat-fishing group – but the father regains custody, even though the townsfolk don’t really trust him any more than the boy does (he’s a foreigner, and makes his living selling keys with supposedly magical powers). The answer to what really happened to the mother may lie at the bottom of that mysterious pit, which is too precipitous and deep to climb into. The father isn’t presented as especially vi­cious, though – he expresses sorrow after the mother’s disappearance, and tries to act reassur­ing when he recaptures the boy from the towns­people (there isn’t much local government, and law enforcement is up to part-time deputies like a window-washer and a teacher), and at first this adds to the sense of dread. But as we learn what little we do of the father’s background – that he ‘‘came from somewhere else,’’ ‘‘a bigger city a long way off, because of trouble there,’’ that he originally spoke a different language – another layer of dread is hinted at, with references to ‘‘a contagion from a vast other country.’’ This becomes more apparent when the census-taker arrives at the house, ‘‘needing information’’ from certain people, including the father. This enigmatic figure tells the boy his job is ‘‘count­ing people from my home,’’ because they had dispersed ‘‘after troubles.’’ Those ‘‘troubles,’’ referred to in oblique ways throughout the novel, are what really expands This Census-Taker’s scope from an odd small-scale murder mystery into a more apocalyptic narrative, with its suggestions of wars, refugee crises, and dia­sporas. When the boy decides to sign on with the census-taker as an apprentice (not really a spoiler, since we learn early on that he’s writing from the perspective of a functionary reporting to a ‘‘line manager’’), we’re not entirely sure if he’s being rescued from a deranged parent or co-opted into a shadowy system whose pa­rameters we barely understand. 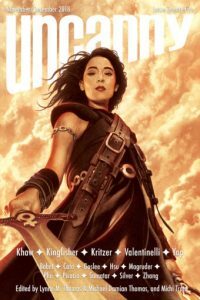 While this am­biguity, and the generally understated tone of the narrative, may disappoint some looking for the usual Miéville fireworks, it may well haunt those readers who have valued his fierce intel­ligence and provocative nuances as much as his more baroque fancies.